Nationalism is an infantile disease. It's the measles of humanity. The One Planet Accord is a campaign commissioned by the International Church of Metaphysical Humanism to raise global awareness regarding the human condition. It advocates equality, world peace and unity, practical and healthy life-skills, higher consciousness, and spiritual enlightenment. These ideologies are symbolized on the One Planet Flag below. We invite all like-minded individuals to join, adopt, and support this Accord by becoming One Planet Ambassadors and posting the One Planet Flag on their websites (Church membership not required). Since everything and everyone comes from the stuff of stars, we cannot rightfully harbor prejudices against our fellow humans for being different in some way. The One Planet Accord promotes equality in genders, ethnicities, and gender sexual preferences. Furthermore, it respects all beliefs and the right to believe in a particular way provided those beliefs do no harm. Every individual is on a personal journey and must follow his or her own unique path—each with its own lessons, challenges, and triumphs. We are one planet and one race with one ancestry and one destiny. For this reason, the One Planet Accord recognizes the need and practicality of a one world government that serves the needs of humanity in the spirit of Do No Harm as the inevitable result of human evolution. 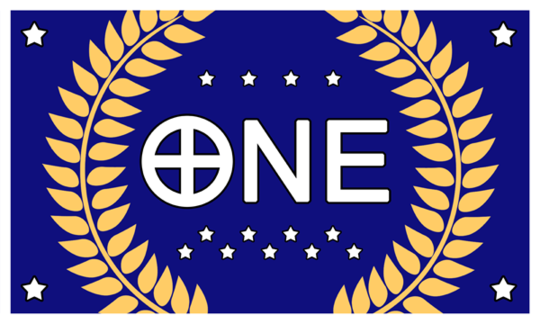 The maxim, One Planet, One Race, One Ancestry, One Destiny is signified on the One Planet Flag by four stars, one in each corner, covering the “four corners of the globe,” as it were. We, as a global village, can no longer afford to allow war mongers and war-mongering religions to extort and rob this world of its peace. We, as a global community, must hold these terrorists accountable for their criminal actions and for continuing to enslave humanity in war and the ugly conditions and aftermath of war. Appropriate action must be taken by peaceful world governments to disallow warring nations and factions to continue. This is not a violation of free will; it is an enforcement of free will—the free will of humanity to enjoy peace. The One Planet Flag uses a wreath to symbolize world peace expanding out into the universe. The One Planet Accord recognizes that happiness and success of all types can only occur when individuals possess healthy life-skills. The most important of these life-skills are contained in the Life Leadership Paragon; specifically, self-acceptance, self-responsibility, respect for free will, and self-completeness. These skills, properly balanced, will have a positive effect on all aspects of life including relationships, employment, communication, and crime. Practical and healthy life-skills as embodied in the four traits of the Life Leadership Paragon are signified as four stars on the One Planet Flag. Humanity now has the tools and educational resources to recognize and appreciate the value of aspiring to a higher consciousness and higher conscious awareness of our place in the Universe. The advances made in quantum physics demonstrate that consciousness plays a significant and, heretofore, unexpected role in our very reality. For the first time in known human history, we have the science to support ancient knowledge that consciousness is the fuel that powers the reality vehicle. We, therefore, aspire to an ever-rising and higher level of consciousness and conscious awareness with the understanding that we and all things are connected at various levels. This higher awareness of our connectedness drives our march toward equality, world peace, successful living, and spiritual enlightenment because when we harm another, we harm ourselves. Higher consciousness and its inherent connectedness are signified as a white border on the One Planet Flag. White is used to symbolize the purity of consciousness. True spiritual enlightenment is the result of higher consciousness, not religious indoctrination. The path of true spiritual enlightenment broadens substantially when we outgrow the need for anything or anyone outside ourselves to complete us. True spiritual enlightenment speaks to us on a soul-level regarding our connectedness—not only to one another—but to all beings in the Universal Community. It guides us on our journey and compels us to recognize and apply greater Universal Laws that include self-acceptance, self-responsibility, and respect for free will. Any technologically advanced civilization that has not annihilated itself must necessarily have evolved spiritually. It is an inherent wisdom of the Universe that makes interstellar travel at faster-than-light speeds so difficult; it prevents aggressive species from conquering other worlds and doing harm. Higher consciousness and spiritual enlightenment prohibit doing harm to others. As we continue to evolve to the next level, may we adopt and apply these cosmic truths in our lives so that we may take our rightful place in the spiritually-evolved Universal Community. Spiritual enlightenment is presented as nine stars on the One Planet Flag to represent the Church's 9 Principles of Belief. These nine principles encapsulate what is required for spiritual enlightenment and self-completeness. In addition, the One Planet Flag utilizes the astronomical symbol assigned to Earth (each planet in our solar system is assigned a symbol). The background of the flag is blue to symbolize Earth as a blue planet. Blue also symbolizes strength, for nothing can defeat the indomitable power of the human spirit. We call upon all like-minded individuals to adopt and support the One Planet Accord by living in harmony with and advocating the principles above. Become a One Planet Ambassador by posting the One Planet Flag on your website(s). There is no cost and you do not need to be a Church member. Simply choose a flag variation from the “Website Flag Banners” tab above and paste the code on your website. Optionally, you can email us your website title(s) and URL(s) and we will add your link to our list (see the tab above). Send requests to admin@ICMHChurch.org with the subject line of “One Planet Ambassadors List”. Get a One Planet Flag for your website (you do not need to be a Church member). Simply choose a flag type and size, then paste the script into your webpage. Email us your website title and URL, and we will add you to the list below. This will also provide an additional link to your website which will aid with search engine rankings. We are working on making One Planet bumper stickers available as well as actual flags in various sizes. Bumper stickers are now available in mid-April (2013). They are 3" x 10" in size and are made with no-peel 4mil UV & water resistant vinyl (see the graphic below). To get your bumper sticker, please send a donation of $10 or more (U.S.), or $35 or more (Int'l). Your donations support the Church's global educational work. The One Planet Accord was launched in February 2013. It is our hope that many people will add their names to the list below. To add your name, place the One Planet Flag on your website(s), then email us at admin@ICMHChurch.org with your name, website title(s), website URL(s), and the location where you have added the One Planet flag. NOTE: You must place the One Planet Flag on your website before requesting to be added to this list. Please include the link where the One Planet Flag is located on your website(s).